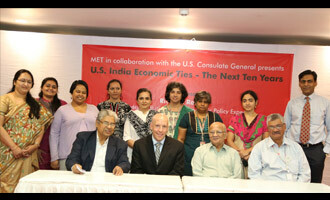 On December 17, 2014 MET Schools of Management in association with the U.S. Consulate conducted an interactive session on the "US India Economic Ties - The Next 10 Years". American Business and Economic Policy Expert, Mr. Richard Rossow was the speaker for the day. He discussed the significance of various Bilateral Investment Treaties between India & US and the areas and sectors which would get benefit of such treaties in future. Mr. Rossow is a Senior Fellow who holds the Wadhwani Chair in U.S. - India Policy Studies at CSIS (Center for Strategic and International Studies) and works on developing policies to promote greater business and economic engagement between the two countries. He joined CSIS in 2014, having spent the last 16 years working in a variety of capacities to strengthen the partnership between the United States and India. Management students, members of the faculty and other distinguished guests and dignitaries attended this insightful, knowledgeable conference.